Fr John Emerson was ordained to the priesthood in June 1981 and incardinated into the FSSP in November 1988. He is based in Edinburgh, Scotland and is in charge of our Scottish apostolate. Fr de Malleray was born in 1971 in Anjou, France, in a large practising Catholic family. He grew up in the Loire Valley, in the Diocese of Nantes. From thirteen to twenty-three, he lived in Paris for college and university studies, reading Modern Literature at the Sorbonne. He left France in 1994 and never since resided in his home country. After military service in Budapest, Hungary, he entered St Peter’s International Seminary in Bavaria in 1995, where he was ordained a priest in 2001. Later that summer, he was sent to England, being assigned to St Bede’s Parish, Clapham Park, in the Archdiocese of Southwark. In 2004, he was asked to take up an administrative position at the General House of the FSSP in Fribourg, Switzerland. Fr de Malleray also became the Chaplain of the Juventutem movement. 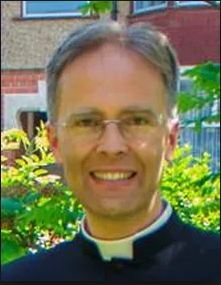 In August 2008, Fr de Malleray was sent back to Our Lady’s Dowry, to set up the new permanent base of FSSP England in Reading, in the Portsmouth Diocese. 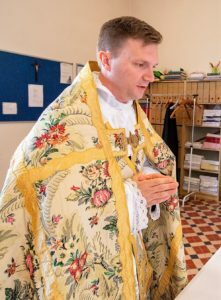 As well as his daily ministry at St William of York Church, Fr de Malleray has been the editor of Dowry, the quarterly magazine of the FSSP in England. He also gives spiritual retreats to the laity and to the clergy. As of 2007, Fr de Malleray, is Chaplain of the Confraternity of St Peter (the 6,000 strong international sodality linked with the FSSP). Since November 2015, he is the Rector of St Mary’s Shrine in Warrington, while remaining the superior of the English apostolate of the FSSP. Fr Konrad Loewenstein, FSSP was born in England in 1958, of Bavarian descent. After A-levels, he studied at Oxford (Christ Church) and later taught in the U.S.A. He joined the Priestly Fraternity of St Peter in 1997, studying at our motherhouse in Wigratzbad. After his priestly ordination in 2002, he taught at our seminary and later on started our apostolate in Venice, Italy, where he served for a decade. In November 2017, he came to St Mary’s Warrington temporarily, and is now assigned there permanently as Assistant priest. Fr Lowenstein’s brother is also a priest, in the English Dominican province, and his late father was a well-known supporter of the traditional Latin Mass. He entered the Fraternity of St Peter’s international seminary in North America in 2002 and was ordained to the priesthood in May 2009. After 3 years ministering as Assistant Priest in the Fraternity of St Peter’s parish in Ottawa, Canada, he was assigned to Reading as Assistant Priest in July 2012 and has been leading the Community since September 2015. He was named the first Parish Priest of the personal Parish of St John Fisher, Reading, at its establishment in September 2018. Fr Goddard is also the Bursar of our English apostolate. Fr Ian Verrier, an Assistant Priest at St Mary’s Shrine, Warrington, was born in Birmingham and raised an Anglican. He read Music at The University of Birmingham, during which time he became a Catholic. He pursued postgraduate cello performance at The Royal Northern College of Music (RNCM) and gained a Post Graduate Certificate in Education with specialist string teaching at the RNCM and The Manchester Metropolitan University. He plays the cello, harpsichord, piano and organ. He taught Catechism and Music whilst being Head of the Lower School at a Catholic boarding school in France, before entering the Fraternity’s international seminary in North American in 2008. There, among other duties, he was organist, led the polyphonic choir and a Gregorian chant schola. He was ordained to the priesthood in May 2015, served as an Assistant Priest in the FSSP’s Reading-based apostolate until the end of 2017 after which time he was reassigned to St Mary’s Shrine, Warrington where he is now Assistant priest. ​Fr Seth Phipps was born in Bath, England, where he was raised as an Anglican. He studied Classics at Oxford, where he became Catholic. While completing a doctorate in the obscure topic of ‘Greek poetry in the fourth century BC’, he felt God’s call to the priesthood, and after discovering the FSSP through a retreat in Reading, he entered the seminary in Denton, Nebraska in 2011. He was ordained to the sacred priesthood at St Mary’s, Warrington, in June 2018 and is currently assigned as an Assistant Priest at St John Fisher Parish, Reading. Fr Phipps’s main ‘extracurricular’ interests are music (at one time he wished to be a professional orchestral musician, while at seminary he sang in the chant and polyphonic scholas) and football (he was captain of the seminary team until age took its toll). ​Fr Patrick O’Donohue serves as an Assistant Priest at St John Fisher Parish, Reading. He is originally from Clare in the west of Ireland. Subsequent to receiving a Bachelor of Arts in English Literature and Philosophy from the National University of Ireland, his time as a Seminarian at the Pontifical Irish College earned him a theology degree from the Gregorian University in Rome. He was later awarded a Bachelor of Philosophy and a Licentiate of Sacred Theology, with a thesis topic centred on the theology of Pope Benedict XVI. 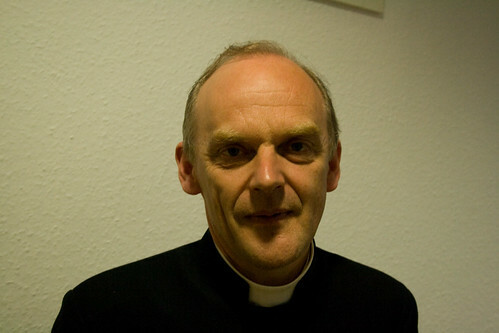 Following his ordination on the Feast of Corpus Christi in 2010, he served for four years as a University Chaplain in Galway, after which he was assigned to parish ministry near Galway city. He spent a total of three years in the parishes of the Good Shepherd and the Annunciation of the Blessed Virgin Mary prior to arriving at the Reading apostolate in September 2017. In September 2018, he was incorporated into the Priestly Fraternity of St Peter.